Planning to pick up a bunch of PS4 games at launch? You may want to check this out. 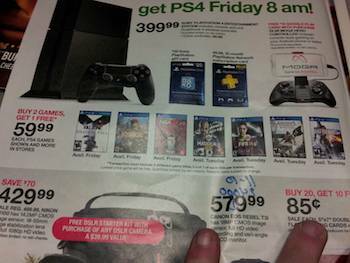 Target wants you to buy your PS4 games from them. According to an upcoming circular, the retailer will run a "buy two, get one free" sale on a select number of PS4 launch title in their stores during the week leading up to the console's launch next month. The ad, which popped up on Reddit yesterday, says the sale will only apply to certain games, including Assassin's Creed IV: Black Flag, Killzone: Shadow Fall, Knack, Battlefield 4, Madden 25, NBA 2K14 and FIFA 14. The ad does say that other PS4 games will be eligible for the deal, and does not specify which ones, if any, are exempt. The deal is only available for in-store purchases: It does not apply to pre-orders, games bought online or "rain-check" orders. Also, the deal only applies to customers buying three different games: That means no pooling cash with friends to get three copies of Killzone or Battlefield on the cheap. Similar to many deals of this sort, the least expensive game will be the one consumers get for free. Target's sale runs from November 10 to November 16. The Playstation 4 launches in North America Friday, November 15th.